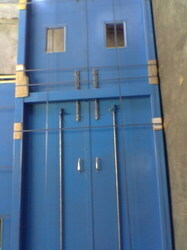 Leading Manufacturer of steel safety door and mild steel window from Surat. We manufacture one of the best safety doors at a reasonable that are very durable compare to the most of the safety doors available in the market.The sizes that we have manufactured of the safety doors are more than 15 feet. Also our doors are of great quality and donot rust or wear out and can withstand impact criteria in general cases.